Trail Running is quickly becoming a popular way for locals and visitors alike to experience trails throughout the world, and the mountain parks are considered one of the top trail running destinations. Many runners simply take hiking trails and instead of walking, they run. It allows them to see more locations and scenery while getting a great workout at the same time. These runs can also be used as a great hike – although some of the longer ones will need more than one day for a walker to complete. And in turn, most of the great hikes in the area can be run. Don’t be afraid to piece together trails or shorten distances to suit your ability. This is an infinitely small selection of the trail runs available in the chosen areas. As with all backcountry activities, be aware of wildlife, run in groups when possible and ensure you have enough water and nutrition to make your day an enjoyable one. And don’t forget your camera. The Highline Trail was opened in August 2009 and has quickly become a local favourite. With four entry points, there are plenty of options for either an out-and-back run or loop run. The well maintained and well-marked single track offers uninhibited views overlooking the town of Canmore, and the trail is regularly shovelled during the winter by a group of dedicated mountain bikers. Popular starting points are the Quarry Lake day use area and Three Sisters Blvd. Regardless of where you begin, you’ll only achieve the 8 km rolling traverse by first testing your lungs on the climbing switchbacks. On the North side of the highway, Montane Traverse links Cougar Creek and Harvey Heights above Silvertip Golf Course. A well-travelled 8 km mountain bike trail, this undulating single track appeals to runners of all levels. It offers short side loops or can be extended east to include the approximate 8 km G8 circuit. Finish at Cougar Creek parking lot and treat yourself to a pint at the Iron Goat Pub and Grill. Beginning at the Canmore Nordic Centre, this beautiful trail takes you directly to the Banff Springs Golf Course parallel to the Bow River. If you want to get to Banff on foot, this is the trail to take. Park at the Nordic Centre and follow the Banff Trail (5.5 km) to the start of Rundle Riverside (8.5 km) and follow it directly to Banff. A keen eye for roots and rocks will help you negotiate this somewhat technical trail. You’ll need to either arrange a ride back to Canmore or take advantage of the Bike and Hike Shuttle which runs between Canmore and Banff. A popular cross country skiing trail in the winter, Goat Creek trail gives runners, walkers and mountain bikers a smooth trip between Canmore and Banff. The 18 km one-way double track trail drops approximately 1,000 ft from Canmore to Banff while skirting the base of Mount Rundle. From Canmore, continue past the Nordic Centre on the Spray Lakes Road/Smith- Dorrien highway for approximately 8 km to the large parking lot at the trailhead. Challenge Run: Combine Rundle Riverside and Goat Creek Trail for an epic 42 km trail run from Canmore to Banff and back. Starting at the Canmore Nordic Centre, run to Banff via Rundle Riverside, connect to Goat Creek via the Banff Springs Golf Course road and complete the return trip on the Goat Creek Trail. Finish with a significant downhill on Spray Lakes Road back to the Nordic Centre. The lakeshore trail at Lake Minnewanka is a classic Banff-area trail for runners, hikers and mountain bikers. As one of the first trails to be snow-free in the area, it’s a stunning and fun beginner/intermediate early-season run. From the Lake Minnewanka car park, take the sealed road past the boat docking area and the trailhead will present itself. Although the first part of the trail has some steeper elevation gain, the extent of the whole trail hosts a mildly undulating, winding and fast singletrack. The out-and-back trail is a tad under 30km but is spectacular at any turn-around point making it a favourite for all levels of runner. From the iconic Chateau on the Lake, Chateau Lake Louise, 10 mins from the township of Lake Louise, follow the paved path to the right side of the lake. A wide unpaved pathway leads you, along with many tourists, cameras and over-fed squirrels, to a stunningly picturesque lakeside trail. The trail progressively becomes less of a wide path and more of a singletrack, passing Lake Louise’s ‘Back of the Lake’ rock climbing area. With stunning views of Mt. Lefroy and Mt. Victoria ahead of you and Lake Louise behind you, the trail winds upward to the Teahouse. Enjoy cake and tea and a fast return to complete this 10.6 km run. This well used trail is a gorgeous, and less busy, early morning run. The 8.4 km round trip trail will take you through former forest fire areas, and offers breathtaking scenery with 1,200 ft. elevation gain. Access this trail left from Highway 93 just 3.5 km of the British Columbia/Alberta border. Be prepared for some tourist-dodging during midday summer weather. This run is considered a “must-do” for local ultra running enthusiasts. In its entirety, the Rockwall is an astounding 53 km and is usually completed in 3-5 days by overnight backpackers. 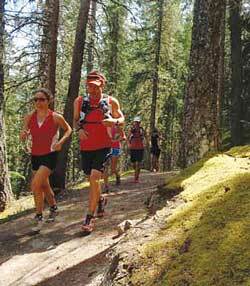 As a one day adventure, with three mountain passes, this run is only for experienced long distance runners. Access this trail at either the Paint Pots parking lot or the Floe Lake parking lot (more popular option) and run the point-to-point trail through majestic mountain terrain. Transportation will be needed to get back to the start, and many locals hitchhike back to the beginning. Shorter traverse options, or emergency exit points, can be created by following Numa Creek (18.5 km) or Tumbling Creek (26.5 km) to reach Highway 93. Trail RunningThe Lake O’Hara area is a must-see in Yoho National Park. Depending on your availability, you can access the multiple trails by either reserving a spot on the shuttle bus that runs from mid-June to early October ($14.70/adult) or running the 11 km access road located 13 km east of Field, B.C. Once there, the trail running options are endless. Download a trail map before you go and plan your route to include any number of trails in beautiful backcountry terrain. Alternatively, set up camp (fees apply) for a couple days and take your time exploring the area. This can be a busy area in high season summer months. Starting at the Whiskey Jack Hostel, runners can complete a 17.5 km circuit (via Celeste Lake) or a 20.8 km circuit (via Little Yoho). Both routes offer views of outstanding landmarks including Emerald Glacier and Canada’s second highest waterfall, Takakkaw Falls. Look out points along the trail encourage some frequent breaks to enjoy the scenery. 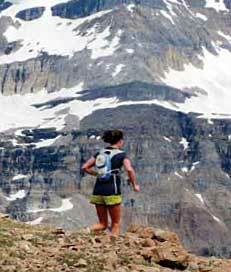 From 27 km west of Lake Louise on Highway 1, follow Yoho Valley west to the hostel and trailhead. Just 9 km south of the Jasper townsite on highway 93, this popular and stunning run allows many options for distance and trails. The traditional short 4.2 km return trail passes wetlands, meadows and five lakes of differing size, colour and uniqueness. The beauty of this area is that trails can be added to make a loop of linking singletrack with endless options and distance including nearby Wabasso Lake. The trailhead for this fast and fun 23 km run is at Old Fort Point. Following singletrack behind the Jasper Park Lodge golf course, the trail rises up some easy hills to Maligne Canyon. Time permitting, take the opportunity to follow the self-guided tour at the Canyon. The trail then follows west along Maligne Rd and hooks up over the Fifth Bridge to Trail 7. Gently making its way back to Old Fort Point, the trail follows the curves and picturesque landscape of the Athabasca River. The trail network in this area opens up a world of options for linking up singletrack for a customized running experience.